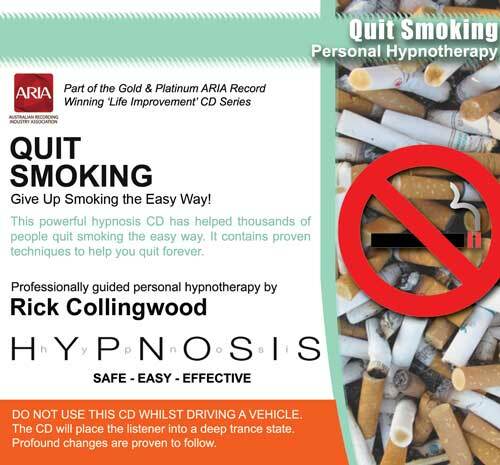 This Personal Hypnotherapy CD has now sold more then 100 000 copies and is a proven way to stop smoking forever. There are a lot of Quit Smoking products on the market, from the traditional patches and gums often to the outright bizarre. This audio program has stood the test of time and helped thousands to stop smoking the natural and easy way. This powerful hypnotherapy program is proven to help you quit smoking whether you are a heavy smoker or just a social smoker. This CD was featured on the popular Australian TV show 'A Current Affair' in 2008 and the televised trial showed an 80% success rate among the trial participants. This program works by aligning your mind and body towards accelerating the quitting process by helping remove the physical and emotional craving for cigarettes. You know that removing this disgusting habit will allow you to regain your health, self-control and finances - now you can have the support of one of the world's leading hypnotists wherever and whenever you need to. Better still - at a fraction of the price for the three sessions usually required with a personal hypnotherapist which can cost hundreds of dollars! Overcome 'High-Risk' situations that promote smoking such as Drinking Alcohol, Coffee, Eating and Stress. In 2006 this CD achieved platinum status with the Australian Recording Industry Association. No other self help or personal development CD author has ever achieved such an accreditation. Rick Collingwood now has 2 Platinum (69 000+ copies) and 5 Gold (33 000 copies+). This is testament to an effective and proven product. Using this program will bring forth a willpower that you never knew was there! You will be pleasantly surprised after regular listening that every time you feel like having a cigarette you will instead reach for a glass of water - with absolutely No Hesitation! Formatted to re-educate your subconscious mind, you will begin to automatically make positive and beneficial choices to realize that You Were Not Born a Smoker so why should you feel compelled to remain one. There was a time when you never craved or wanted a cigarette… remind your mind and body of how it felt before you were a smoker. By simply playing this audio program every day/night you will soon notice a remarkable difference in your attitude towards wanting a smoke because it changes the way you think and act at the deepest emotional level. It is fine to remain on nicotine patches, gums, lozenges and other quit smoking products whilst you use this program, although it will work equally well without them and many people feel that the CD or MP3 alone is sufficient for the quitting process. Just wanted to pass along what a pleasure it was to work with one of the guys at Renosanz Recordings named John. I had ordered a quit smoking CD from Rick and for some reason, never received it. John and I worked back and forth for some time trying to get the CD. Through it all, John was prompt, understanding and accomodating all my needs. He went above and WAY beyond in sending downloadable MP3's to my e-mail...checking on my success in downloading them..Verifying address..and on and on. I can say I thought I may have lost my cash and would never quit smoking without the CD. But, I have to pass along that John was on top of it from the first time I contacted him. You have a great person and the perfect spokesperson for your company. John, WELL DONE. I have been a smoker for 20 plus years. I was never serious about quitting smoking. However, it was my life and my decision to do whatever I wanted to do. Somewhere in April 2009 I was in one of the shops looking around then accidentally I saw a CD collection from Rick Collingwood Quit Smoking I bought that CD like many other items that I purchased before but used late on. In November 2009 I don’t know why but I started listening to the CD probably it was cheaper than any sleeping medication. On the 15 April 2010 I quit smoking, now more than a year later I feel fine not craving at all, and most of all, now I smell nice. I would like to say thank you. I would like to do that in person too. It was my work but you are major contributor. I saved money, got myself a big TV & according to my two children turned our TV room into a mini gym. I purchased every title in your CD collections. I am just wondering do you tailor CD’s for specific use? What about past life experience do you venture into that unexplored territory. Do you ever come to Sydney? This is the first letter I have ever written about a product result, but as a great believer of thank you notes, I wanted to tell you and thank you for my wonderful news. I had been a heavy smoker for 30 years.Tried to stop smoking in the 80s when the bad news came out about smoking and addiction. Even had personal hypnosis sessions, gum, patches, etc. without succeeding. Bought your CD as I had made up my mind that I simply had to stop, but still didn’t KNOW HOW the heck I would be able to actually do that. I had been practicing living a smoke free life for a few weeks by not smoking in the house, thenI listened to the CD for three times, then stopped smoking one day out of the blue……. (I was not actually prepared to stop yet, as far a I knew) and then stuck to my resolve that if I could ever not light up for 24 hours, then I would never light up again. I did it.I still don’t know how.I have used patches to support my success over the past 3 months, but I have had no actual DESIRE to smoke, not even a fond memory of smoking, no cravings, no habits, nothing! It’s almost like I never smoked in the first place. Very odd result for someone who had living hell whenever I tried to stop in the past….. Don’t know how this CD worked so well, but thank you. I’m now going to get the weight loss one…..(Doubleday club again - $10 saving, after all) Then I want the Insomnia one, then I want the Healing one, etc. etc. So keep up the good work.I’m stunned by my results. In 2010 I came upon your site after listening to an interview you did on Coast to Coast. Rick - you seemed like someone I was philosophically attuned with, so I downloaded the free MP3 at that time to see what it was all about. I liked it, and being a cigarette smoker, I decided to purchase your Quit Smoking mp3. I listened to it a couple of times, but decided to keep smoking. About six months later, I came down with a severe case of bronchitis and decided I needed to to quit... I located the Quit Smoking hypnosis session on my computer and transferred it to my mp3 player, and I listened to it as instructed, sometimes several times after I went to bed. I am happy to say that after a year and two months I am still not smoking, and have no desire to start again. I had smoked for 34 years. I just want to say thank you for the work you do. I have purchased some of your other hypnosis sessions for self improvement also, and have had good results and expriences with them. Turns out you're never to old to improve your life and your attitude! Hello Mr Collingwood I bought one of your CDs a few years ago to help quit smoking. I didn’t stop because I used the CD in bed and just went to sleep. Now I’m motivated again, but my CD player doesn’t work well and I wanted to use the tracks on my Ipod. The sleeve advises not to burn or copy it and claims that it may even be dangerous. Do I face any danger if I was to use an MP3 copy of the CD?I must also say that this week I visited a quit hypnotist and after hearing the difference between his session and yours, I can only say that you provide something far superior at a much reduced cost. I may even look to your MP3s for my other vices, but that’s another story. I am pleased to say I have started using the CD. Since March last year I have suffered severe depression and an illness the doctors and specialists are yet to find an answer for. I feel as though I have become a guinea pig and a pin cushion at their disposal. I have been given numerous antidepressants from doctors and specialists from then until a few months ago when I decided myself to be drug free. Each time I was given any medication I would end up back in hospital with what is called Seratonin Syndrome (Google it you are not familiar with it). What those drugs did to me is indescribable. I was nearly inistitutionalised because of this. That in itself was terrifying. The overdose of Seratonin to my brain meant that this happened to me 3 times last year leaving me with terrible anxiety problems on top of the depression. I can honestly say it was the most horrific experience of my life. I have always been a very sensitive person,early in my childhood and of course still now. I am sensitive to light, noise, obviously drugs, and especially people's energy. I just wanted you to know that I have only listened to the CD 3 times and have noticed that I no longer wake up with the fear of dread each morning. This was a huge thing for me as everyday I would awake to severe panic attacks that I had no control over, as waking up in the midst of one didn't even give me the chance to do anything about it prior. One thing I would like to mention is that after listening to the CD for the first time I awoke panic free and with a vision of a pure White Unicorn on a Zebra crossing! (would love to know the significance of this) Maybe weird to you I know, but it was the feeling of utter peace and tranquility I felt when I saw this image made me feel better than I have in many many years. I remember that feeling long ago when I was a child but in my adulthood I just lost it somehow. Now when I feel the anxiety or depression kicking in I use this Unicorn and remember how it felt. Its really an amazing transformation for me, even so early into the programme. I was just wondering if you charge an extra fee for the unicorn? (See I am even getting my sense of humour back). I would love to stay in touch as I am immensley excited at the prospects of the help available not only to me but to others with this CD considering what I have been through since March. Anyway thanks for the Unicorn and I will keep you informed. I’ve used your Quit Smoking CD and I’m happy to report that I haven’t smoked for 2 years now. Thank you so much for the wonderful work you do. I’m completely happy and amazed. I tell everyone I know how wonderfully this worked for me. I have a question. I have a friend that has social avoidance disorder, so he’s scared of people and being rejected and being out in public. Which cd or cd’s would you recommend I purchase for him? I was thinking the “Happiness and Self Esteem” one may help. What about the “Fear and Panic Free” one? Would that be helpful for someone with this disorder? I have another question. After purchasing your weight loss cd I realized I have kind of a phobia of being skinny. I don’t know why. Do you have a cd that may help that? Thanks again. With your quitting smoking cd you’ve saved me time, money, heartache and possibly my life. I have just recently used your Stop Smoking CD with great success! I am a professional Stand Up Comedian and at 36 years of age had been smoking since I was in my early teens. I had tried everything over the past couple of years to give up, all to no avail. Until I happened along your CD while I was in Melbourne. I’m proud to say that I am currently on day 39 without a ciggy, and I feel confident that I can keep this going easily. Believe me, my job has me around smokers every night I go to work, but your CD has been great! Because I’ve had such great success with this form of treatment I am keen to use some other of your CD’s to help me with other aspects of my life. Can I use more that one program at a time? Or is it advisable to complete one program before starting another? Once again, thank you, your method has changed my life and given me the confidence to deal with quitting one very hard addiction. It is with much pleasure that I find myself writing to you this afternoon. I purchased your Quit Smoking CD on the 23-8-2006 and began using the program on the 28-8-2006. It would be very difficult to find the words that could describe how very grateful I am that you had the foresight to record your sessions onto CD. Today I am up to Day 10 and have noticed some amazing changes in how I have felt over the last few days when I have used the program morning and evening. There is a natural flow now, that has never been there before. I would like to say that I have always believed that hypnosis is a wonderful healing modality, I was just not fortunate enough to meet the right hypnotherapist. At this time in my life it is most important that I cease smoking as I had a heart attack on the 13-8-2006. I have a very interesting story to tell which covers a very large part of my life. Briefly, sexual and emotional abuse from my father and then many years of living with major depression. But my story does have a very happy ending. Through much effort and work I have been able to forgive my father and although we are only in phone contact at the present time, I am looking forward to seeing him when I am strong enough to travel. Because no matter what has happened, he will always be my dad and I will always love him dearly. Even better, I have been able to tell him that and it felt so good!!! On the day I had my heart attack, I had a very strong feeling to call him and let him know that I no longer felt any pain re the past. I am sure the feeling was strong because I felt most unwell and shortly after I made the call, I found myself in hospital having a stent put in. I am so very glad that I was able to do that. I know that I need to write my story and I now know that I CAN!!! Because thanks to your CDs I know that healing for me is now possible. If you ever feel that you would like to write a book of case histories, please know that I would be happy to contribute. Meanwhile, please accept my HEARTFELT THANKS for your work. Mark S here asking you for a bit of advice on cd selection and also to say thanks for helping me to overcome the ugly habit of smoking with the use of your STOP SMOKING CD, i have been listening to it for 3 weeks now and cant beleive how it has helped me to give up so easily.